Kathrin Zettel powers her way to a second successive World Cup victory in Maribor this weekend. (CNN) -- Austria's Kathrin Zettel won the women's World Cup slalom in Maribor, Slovenia on Sunday after first-run leader Marlies Schild failed to finish her second run. Schild led by more than a second after the first run, but Zettel claimed her second victory in two days after her compatriot, skiing last, missed a gate on the decisive second run. Zettel, winner of Saturday's giant slalom, clocked a combined time of one minute 42.98 seconds to triumph by 0.71 seconds from Slovenia's Tina Maze and third-placed Maria Riesch of Germany. 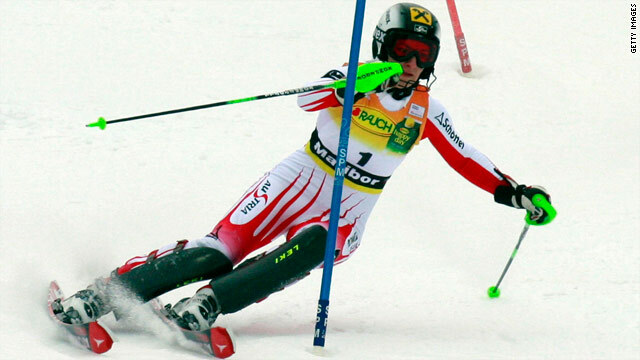 Meanwhile, Ivica Kostelic triumphed in the men's World Cup slalom event in Wengen, Switzerland. The Croatian clocked a combined time of one minute 40.34 seconds to win by 0.29 seconds from Andre Myhrer of Switzerland, with Austria's Reinfried Herbst, the World Cup slalom leader, a further 0.15 seconds behind in third place. Kostelic led by 0.14 seconds after a first run of 51.93 seconds and clocked 48.41 seconds -- the 10th quickest time -- on the second run to secure victory.